I first began to understand the community of DeKalb, Illinois before I ever set foot in the town. When I told friends and acquaintances that I planned to spend the summer creating a community mural in DeKalb, many people started telling me about their time there as students at Northern Illinois University. They still felt a deep connection to the area. From work I have done in other rural places, I know that an important part of the community spirit of a small town are the children who grew up there, but have left to find employment and opportunity elsewhere. As I came to meet the people and see the town of today, I was always aware of this shadow community--the people who have passed through who are still part of this place. Although it sounds a bit highhat for the Midwest, I like to describe my work as a community public artist with the French term, bricoleur--one who works with any tools at hand. My work is bricolage--it’s the same data, the same photos, the same stuff, the same stories--it’s just organized differently. I collect fragments; I compose a picture; I create a structure on which the community can further elaborate its identity. The title of the mural is: Its Merits Recommend It... The phrase is taken from an old barbed wire fence advertisement. DeKalb is not a place uniquely blessed by nature. It’s in the prairie--flat and regularly platted. Its river, the Kishwaukee, is sometimes barely a stream. Endless rows of corn surround it and noisy trains cut through it. What are the merits that recommend DeKalb? It's a town with industrious people and a history of industry. People here invented and manufactured. Two innovations that changed the history of the world--barbed wired and hybridized corn--are intimately associated with the history and growth of DeKalb. In 1899 when the Illinois State Legislature was choosing a site for a new teachers’ college, the barbed wire barons of DeKalb cooperated to bring the new school to their town. They used their influence and donations of land and money to make DeKalb the most attractive choice. Local legend tells that being aware that the legislators wanted to build near a river, the people of DeKalb went without water for several days, damned up the Kishwaukee, and then released the waters to create a pleasing flow just as the site committee crossed the bridge. Hard work, humor, and civic responsibility. If you don’t have merits, make them. Annie Glidden, a niece of barbwire inventor Joseph Glidden, figures large in the imagination of those who know the history of DeKalb. It’s hard to say exactly why. She was evidently quite a character. Some of the elders still remember her. Many remember stories about her. She was an independent woman, an award-winning farmer, and a lifelong learner. 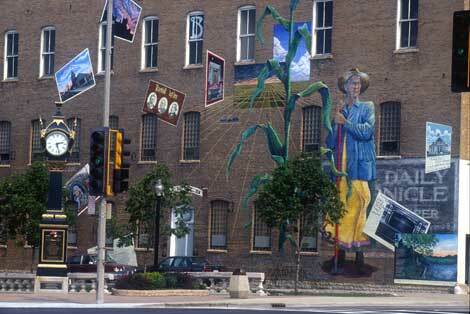 In the mural, stories about her are interwoven with the roots of the corn. We wanted to paint Annie as an active, confident woman in her sixties. I created her portrait from photographs of her as a young woman and as a woman in her eighties. I drew from the bodies, ears, necks, eyes, and hands of the women on the mural committee. She is quite literally an amalgam of community qualities. For me, Annie represents a community rooted in character qualities such as independence, entrepreneurship, and community-mindedness. I like the layers of history on the wall. When the paint of a contemporary sign was stripped off and we discovered remnants of the original Daily Chronicle sign, I changed the mural design to incorporate this discovery. On the lower left area of the wall, one can still see traces of the carved initials that newsboys made as they waited for their papers. We only noticed these because an old man who came by and told us this story from his youth pointed them out. One of the things I like about the mural is the layering of imagery onto the bare bricks. This bareness is a labor of love. It is not easy to keep thousands of brushstrokes from dripping paint on the wall. Scattered throughout the mural are transparent portraits of people from the NIU and DeKalb High School yearbooks. They are the people of the past and present, present and absent, who are part of DeKalb’s history and community.